Earlier in the week I shared a pair of my works from Colors! 3D. As I promised in the comments section of that article, I have a full review of this painting application today. Is Colors! 3D easy to use, intuitive, and worthy of your digital dollars? Back when the Nintendo 3DS originally came out more than a year ago, the system did not have an online shop. It was up until months later that the 3DS would get an eShop, and even then the pickings were quite slim. Now over a year later, the eShop has built a steady catalog of original content. Nintendo seems more interested in quality over quantity this go around as evident by the small selection of 3DSWare titles. 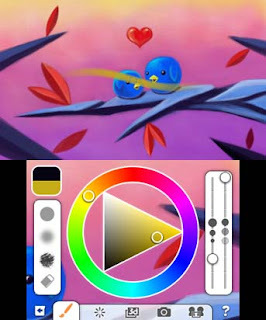 One of the latest is Collecting Smiles' painting application (also available in 2D on iOS) Colors! 3D. It's the type of app that is beneficial and fun even for people without a sense for artistry. Starting off with a blank canvas can be quite intimidating. The creative juices need time to get flowing, the ideas need to come pouring in, and you need to become familiar with the tools given to you. The latter problem is alleviated by the various help options Colors! 3D presents to the user. Every facet of the program is labeled clearly. The controls of the application are easy to learn too. For instance, pressing the L button pops up the color wheel and brush settings. You can utilize an entire range of colors, shades of colors, and hues at your leisure. You can adjust the levers on the right side to make your brushstrokes as large or as small, solid or as fuzzy, and full or as translucent as you desire. Meanwhile, the R button is used as an undo function. Additionally, the d-pad is utilized in various ways such as moving around the canvas, changing the color of your brush to one that is already a part of your painting, and numerous other features. amount of hues to choose from. The difference between the 3DS version of Colors! 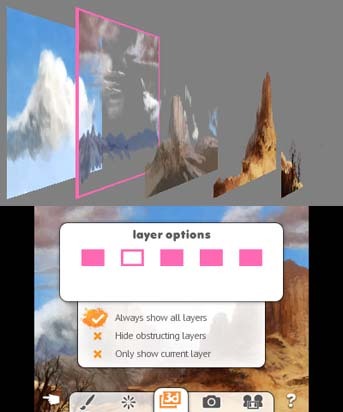 3D and iOS iteration is that with the 3DS you can switch between one of five layers to create a 3D effect for your painting. This is where the super-helpful Circle Pad comes in. With it you can alternate between the five layers to create impressive stereoscopic effects that aren't possible on the iOS version. Also with the Circle Pad you are able to zoom in or zoom out on your canvas which allows for either a full view of your aesthetic wonder or the ability to perform delicate details on your painting. The tools are there to craft some of the most jaw-dropping and gorgeous works imaginable. your paintings can come to life. For those who don't have the greatest artistic sense or cannot draw as well, Colors! 3D allows you to take a picture from your 3DS' SD card and use it as an overlay. You can then trace it to the best of your ability. Of course, painting and shading in your tracing is up to you. After your work of art (or lack thereof) has been completed, you can upload it to the Gallery. First, however, you must set up an account. All you need to do is use your 3DS to put your artist name, put in an e-mail, and set a password to have an account. You can view other artists' works and see them drawn out in real time. You can also save your favorites to your own personal gallery, add a comment, like it, and save it to an SD card. If you lack a 3DS and want to see works by aspiring artists, you can log onto the official Colors! 3D website where you can view paintings by artists and subjects. The level of expertise created by the community is incredible. The majority of the art is fantastic, though there are a fair share of duds such as people putting their system's friend code as the sole attraction of their piece. Sort of missing the point on not only the program, but also how friend codes are supposed to work. project with the timeline function. The interface of Colors! 3D is sleek and easy-to-use. Regardless, the lack of a fill tool makes for an annoyance when you want to paint in a section of your canvas with a snap of the fingers. 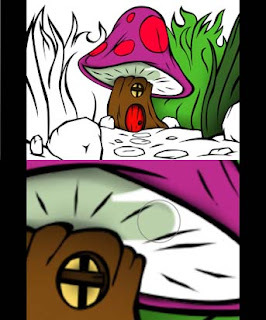 Also, occasionally when uploading or downloading another's work, a layer can get removed. This is a known glitch that can only be resolved by doing a backwards-minded series of steps. I've also had the application crash on me once or twice. Luckily I had my painting saved. Finally, making details on direct locations of the canvas can be tricky as the brush cursor does not always match the stylus' position on the touch screen. You can get around this by recalibrating the bottom screen, but it will affect your controls in other games. These problems are all small, but they add up to be major inconveniences. Colors! 3D's interface is amazingly simple to use. Colors! 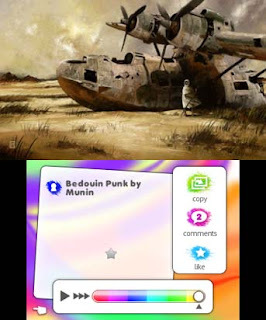 3D is an excellent painting app that those skilled with the brush will absolutely love, and even those without an artistic bone in their body will fine some enjoyment in. The ability to share your works with the community, paint locally with some friends via multiplayer, and overlay pictures to trace all create a masterpiece of an application. This is one of the better titles on 3DSWare, and it is one that if you have a lot of ideas, you will find plenty of bang for your proverbial buck. My only problem with Colors 3D is how unrealistic the brushes are. I prefer something like Art Academy or uDraw that emulates the way real brushes work. A really minor criticism though, because I really do love this software. I haven't read much of anything bad about this title yet. Interesting, though I suspect my kids would get more mileage out of it than I would.